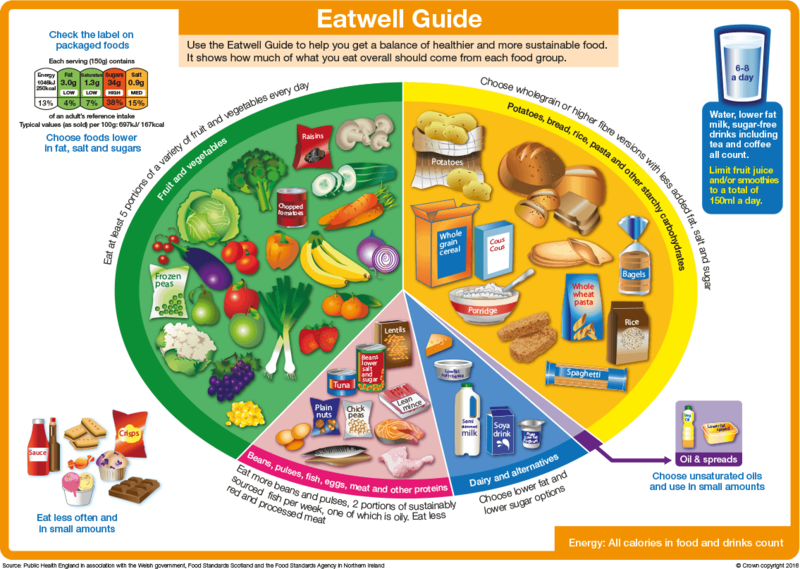 Use the Eatwell Guide to help you get a balance of healthier and more sustainable food. It shows how much of what you eat overall should come from each food group. Check the label on packaged foods. Choose foods lower in fat, salt, and sugars. Water, lower fat milk, sugar-free drinks including tea and coffee all count. Limit fruit juice and/or smoothies to a total of 150ml a day. Eat more beans and pulses, 2 portions of sustainably sourced fish per week, one of which is oily. Eat less red and processed meat. What is ‘a portion’ of fruit and vegetables? Remember though, that no matter how many portions of fruit juice, smoothie or dried fruit you have in a day, they only count once towards your five a day. Any more than that only contributes unnecessary extra sugar to your diet. Potatoes are a starchy food, and although it’s good to eat starchy foods, they don’t count towards your five a day. Starchy foods are a really important part of a healthy diet and should make up roughly a third of your diet. As well as being a good source of energy, they also provide fibre, calcium, iron and B vitamins. 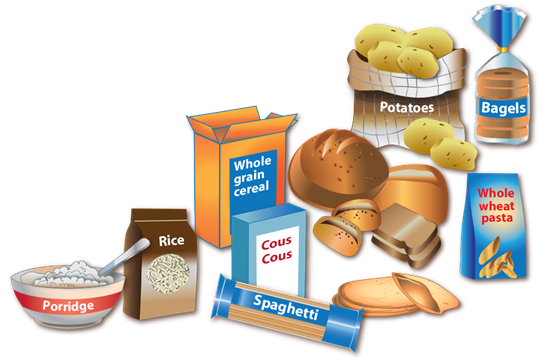 Starchy foods include bread, cereals, rice, pasta and potatoes. Wherever possible, choose higher-fibre, wholegrain versions because they tend to contain more fibre and nutrients. They are also digested more slowly and so can keep you feeling full for longer. Examples of wholegrain food include: wholegrain and wholemeal bread, pitta and chapatti, brown rice, wholewheat pasta, whole oats and wholegrain breakfast cereals. You can also buy high fibre white versions of pasta and bread which can help you increase your fibre intake. Start your day with a wholegrain breakfast cereal. Have a sandwhich for lunch, prefereably with wholemeal bread. Have potatoes, pasta, or rice with your evening meal. Starchy foods contain less than half the calories of fat too – but watch out for the added fats and sugars that are added when cooking or serving starchy foods, like butter, oils, spreads, cheese or jam. 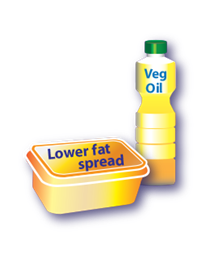 If you do add anything to your starchy foods, choose healthier options like unsaturated oils or lower-fat spreads. Checking the label on bread and rolls will help you choose the versions with the lowest salt. You should include some of these foods in your diet, because they are important sources of protein, as well as vitamins and calcium. Calcium is important for keeping our bones strong. But be careful, as some dairy products can be high in fat, especially saturated fat, sugar, or salt. For example, most cheeses contain a lot of saturated fat and salt, and some yogurts can contain lots of added sugars. Checking the label will help you choose healthier versions. Why not try using strongly flavored cheeses while cooking? You can use less of them than you would with a milder cheese, but still get the flavor your recipe needs, and all with less fat! Lower fat milks like semi-skimmed, skimmed, or 1% fat milk, are much lower in fat than full fat milk, but still provide protein and important vitamins and minerals like calcium. 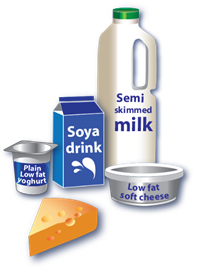 There are plenty of lower and low-fat yoghurts and fromage frais to choose from too, but don’t forget to check the labels and look for unsweetened or versions with less sugar. Including some of these foods in your diet provides your body with a good source of protein. They are also rich in vitamins and minerals too. Meat is a good source of protein, vitamins and minerals, as well as being one of the main sources of vitamin B12. It’s just a case of knowing which meats are high in fat, and aiming to choose leaner options instead. Red meats include beef, lamb and pork, while processed meat includes ham, salami and other cured meats, sausages, bacon and reformed meat products. Scientific evidence suggests that eating too much of these could increase your risk of bowel cancer. So, you should eat no more than 70 g of red and processed meat a day. That means about 2 slices of roast meat a day, or 2 sausages. If you eat a lot of red and processed meat (over 90g per person per day, which is around 3 slices of roast meat), you should try to reduce your intake. For a healthier choice, you could swap some or all of the read and processed meat you consume with white meats like chicken or turkey, fish, eggs or beans, peas and lentils. You could even try meat-free days. Some types of meat are higher in fat, especially saturated fat. Eating lots of this type of fat increases your cholesterol levels. Choose leaner cuts, remove the skin from chicken and trim visible fat (e.g. from rashers of bacon) and avoid adding too much extra fat/oil while cooking. Usually, the more white you can see on red meat, the more fat it contains. Grilling meat instead of frying helps to reduce the amount of fat in the meat. Also if you’re roasting meat, a good tip is to put it on a metal rack above a roasting tin, so the fat can run out. And because meat contains its own fat, you don’t need to add much extra fat or oil, either. Choose leaner cutes of meat while out shopping, or ask your butcher. Check the label on pre-packed meat, and choose those which are lower in fat. Sausages, salami, pâté, beef burgers and other processed meat products can be high in fat and salt: check the labels and choose the healthiest choice. Remove the skin from turkey and chicken before cooking to reduce the fat. You should aim to eat at least two portions of fish (each weighing at least 140g) every week. One of these portions should be an oil rich fish, like salmon, mackerel or herring. Fish is a great source of protein, and contains many vitamins and minerals too. Oil-rich fish contain lots of omega 3 fatty acids, which are important for keeping your heart healthy. Oil-rich fish contains lots of omega-3 fatty acids, which are imporatnt for keeping your heart healthy. These types of fish are also good sources of vitamins A and D.
Salmon, mackerel, trout, herring, sardines, pilchards are all examples of oil rich fish - you can choose from fresh, frozen or tinned. White fish is very low in fat. So it can be a healthier, low-fat alternative to red or processed meat. All fish, including white fish, contain important vitamins and minerals. Haddock, plaice, coley, cod, tinned tuna, skate and hake are all examples of white fish. The fish you eat can be fresh, frozen or canned – it all counts. But remember that fish canned in brine, as well as smoked fish can be high in salt. Fish and shellfish provide us with many essential vitamins and minerals, including niacin, selenium and iodine. Depending on the fish you choose, there may be other nutritional benefits too. Steaming, baking and grilling fish or shellfish is a healthier way to prepare them than frying, as fried fish (especially battered fried fish) contains more fat. But the occasional portion of fish and chips is fine, once in a while. Eggs are a good source of protein and they are easy to prepare. There’s no recommended limit on how many you can eat in a week. Try to avoid adding extra fat/oil or salt to them during cooking – why not try boiled or poached eggs, instead of fried? Poached, scrambled or boiled eggs are all easy and healthy ways of eating eggs. If you are frying your eggs or making an omelette, avoid adding too much oil to the pan, and opt for healthier unsaturated oils like vegetable oil, rapeseed oil or olive oil. Quiches and flans also contain eggs, but be careful – they can be high in fats and salt, so try to only eat these occasionally and in smaller amounts. The pastry can also be high in fat in salt. Pulses are edible seeds that grow in a pod. They include the whole range of beans, peas and lentils, and you can add them to soups, casseroles and meat sauces to add extra texture and flavor. That means you can use less meat, which makes the dish lower in fat and maybe even cheaper. They also add fibre to your meal, which can help reduce our risk of heart disease. Beans peas and lentils are all types of pulses and are good sources of protein and fibre, vitamins and minerals and are naturally very low in fat. These make a great addition to the dishes you cook at home, and can bulk them out and help them go further. You could even use them as a tasty alternative to meat in soups, casseroles and sauces. 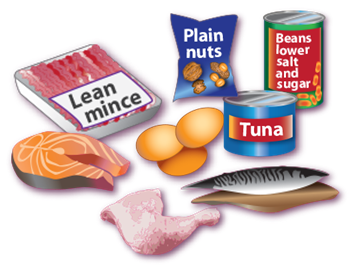 Although some fat in the diet is essential – most people are eating too much and should be cutting down. Choose oils from plant based sources which are rich in unsaturated fats and are liquid oils such as vegetable, rapeseed and olive oil. These types of fats help to reduce our cholesterol, which is why it is important for us to get most of our fat from unsaturated sources. Lower fat spreads are a good alternative to butter to help reduce your saturated fat intake. Remember though, all types of fat are high in energy and should be limited in the diet. Remember: reducing the amount of saturated fat you eat can help lower your cholesterol and reduce your risk of heart disease. Our bodies are two-thirds water, so drinking plenty of fluid is essential to keep our bodies working. Your body needs between 6-8 glasses of fluid each day, or you may become dehydrated. You need to keep topping your body up with fluid, because we constantly lose it through breathing, sweating or going to the toilet. You may need even more fluid that normal if it is hot or you are exercising. Just like with food, some drinks are healthier choices than others such as water, lower fat milk and sugar free drinks, including tea and coffee. Fruit juice and fruit smoothies contain many vitamins and minerals. However, only one small glass (150ml) of fruit juice or smoothie counts towards your 5 a day because they also contain lots of sugar, which is harmful to teeth. Drinking any more than one portion is just providing us with extra sugar that we don’t need. Remember to check the labels of drinks because many drinks contain hidden added sugars, which means they contain a lot of calories - and very few nutrients, so you should limit these types of drinks in your diet. Try swapping to sugar free varieties, milk or water or have a smaller amounts. Drinking too much alcohol can be damaging to your health. Alcohol is also high in calories, so it can make you put on weight if you drink too much of it too often, so limit the amount you drink to no more than 14 units per week. You can visit the Drinkaware website, for more information about alcohol guidelines. Tea, coffee and cola drinks contain caffeine, which means they could make your body lose more water than normal by passing more urine. So you may need a drink again sooner after drinking any of these drinks, to top keep yourself hydrated. Your urine may be darker than usual, or you don’t pass much when you go to the toilet. You feel confused or irritable. Lots of pre-packaged foods have a food label on the front of pack which shows the nutrition information per serving. They also refer to reference intake which tells you how much of each nutrient should be included in the daily diet. The percentage refers to the contribution that the product makes to the reference intake for each nutrient. 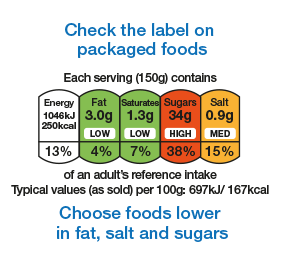 Food labels can help you to choose between foods and to pick those that are lower in calories, fat, saturated fat, sugar and salt. 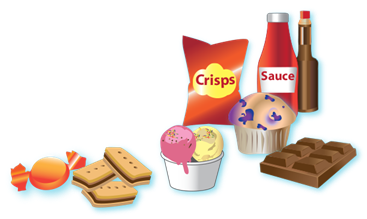 Where colour coded labels are used you can tell at a glance if they are high, medium or low in fat, saturated fat, sugars and salt. For a healthier choice, try to pick products with more greens and ambers and fewer reds. Remember that the portion sizes used on the label are suggestions and may not be the same as you actually consume. For example, some foods and drinks commonly consumed as single servings have the nutritional information presented per half pack. Congratulations, you have placed the foods into the correct food groups. Remember that the Guide also shows how much of what you eat overall should come from each food group.